Field work has just ended and I am currently in Mexico with our Director of Projects, Liz Lee, and CyArk partner (and friend) Frank Collazo of Leica Geosystems HDS. We have come to the wonderous site of Teotihuacan in collaboration with Mexico's INAH and the World Monuments Fund in order to Digitally Preserve the Pyramid of the Feathered Serpent, Quetzalcoatl. With a front (West facing) facade bursting with variable and numerous serpent heads, some with remnants of their original red and white frescoing, the pyramid is nothing short of incredible! Unfortunately though, this remarkable structure is badly eroded and the serpent heads that once decorated each of its six tiers (steps) are mostly gone with only 33 remaining on the front facade of the pyramid; a few others are located within the site museum. And only one of the pyramid heads still dons its original jet-black obsidian eyes. The other three sides of the pyramid are rounded from erosion, hardly resembling a multi-tiered monument. As such, efforts at the park have been focusing on the conservation of the ruin to prevent further degradation and damage, much of which is being caused by moisture. After two days in the field with a Leica HDS6000, our team completed the scanning of Quetzalcoatl's temple with 28 scans and the collection of nearly 385 million data points. 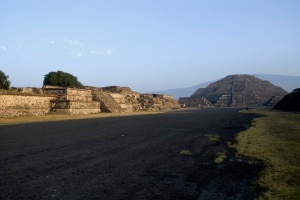 Additional photographic panoramas were taken of the target pyramid as well as other archaeologically significant sites within Teotihuacan, notably the Avenue of the Dead, the Pyramid of the Moon, and the Pyramid of the Sun--the world's third largest pyramid. The Digital Preservation data collected will be used by INAH to contribute too and aide ongoing preservation and conservation work at the Pyramid of Quetzalcoatl. It will provide topographic information of the pyramid and detailed surface information to monitor stones which may come loose during the erosion process. It can also provide detailed data for the intricate serpent heads which are suffering from salt damage (the salt is being transfered to the stones through excess moisture and left behind during evaporation). The data will also provide resources for other researchers and the interested public via the CyArk archive when the Digital Preservation project goes live next year. The shear vastness of Teotihuacan and its truly monumental structures is awe-inspiring. We were very grateful for the support of WMF and it was a great priviledge to work with INAH. We at CyArk look forward to continued collaborations at Teotihuacan and other remarkable sites within Mexico. Scan data for the Pyramid of Quetzalcoatl at Teotihuacan. 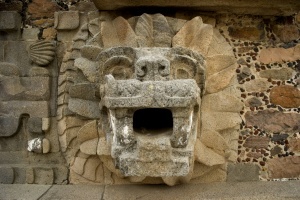 Close-up of one of the multiple Feathered Serpent incarnations of Quetzalcoatl. The Pyramid of the Moon as seen while walking the Avenue of the Dead.